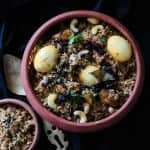 EASY CHICKEN POT BIRYANI, THIS SIMPLE, EASY TO FOLLOW INSTRUCTIONS ON HOW TO MAKE A SRILANKAN INSPIRED POT BIRYANI IS NOT JUST FOR SPECIAL OCCASIONS BUT MAKES AN EASY MEAL FOR FAMILIES, A CROWD OR PARTIES. You will need a large bowl, frying pan and two large cooking pans, Use the largest pot to assemble the Biryani. So let's follow the following four steps in order and assemble the Biryani. 1. marinating the chicken -First, marinade the Chicken with half a teaspoon of Salt, one teaspoon each Coriander, Cumin and 1/2 a teaspoon of Chilli, Garam masala, mix with the chicken followed by a cup of Yoghurt and Coconut milk each, merge all the ingredients together, check for seasoning and refrigerate for 2 to 3 hours, try to marinade the chicken early so you can leave it for several hours, this will help the chicken to absorb more. 2. Cooking the rice- Wash the rice while making sure not to soak it too long, drain well, as we need the cooked grains to be almost raw. Pour water into the pan, the amount of liquid should be less than usual, so the amount of water should just reach the first line on your middle finger(see above image). Add Salt to the rice and stir, keep in mind, the result of cooking the rice will result is almost raw. Use a pan which has a tight lid, add the water and rice into the pan and cook over high heat the first 5 minutes. Once the 5 minutes of cooking over high heat is over, reduce the heat and cook for a further 10-15 minutes less on low fire, once the water evaporates take the pan away from the stove. Open the lid of the pan, use a fork to fluff the rice so they don't stick together and leave the pan open, when you check the rice grain, you;ll notice the middle is whiter than the surrounding of it, this is what we are looking for. Set aside. 3. the frying of key ingredients Place a pan over medium heat and pour in the oil, add the sliced Onions, once they start turning translucent, add the leftover spices Cumin, Coriander, chilli and Garam masala, followed by curry leaves, ginger-garlic paste, Cardamom, Cinnamon and sliced Tomatoes, fry until they turn into a liquid paste. during this process try to keep the heat low medium to avoid burning the ingredients too soon. Save any left-over Oil, you will need it when layering. 4. Assembling the chicken pot Biryani to cook- Now that you have the rice, fried Onion paste and the marinated chicken ready, it's time to bring them together.Try to use a large, deep pan as the rice and chicken will be layered alternately and once cooked, you will need room in the pan to mix. Separate the fried Onion paste into 3-4 portions. Begin by placing the first portion of the Onion in the bottom of the pan, pour in the oil you fried the onions as well, follow it by adding a layer of marinated chicken and then rice. layer this way until you've finished the onion paste, chicken and rice. Make sure the layers are closely packed. The top layer should be rice, cover with a tight-lipped lid and cook on low heat for 10-15 minutes, if you feel the rice needs a few more minutes, extend the cooking time. keep the fire on low-heat to avoid the bottom layer from burning Once the 15 minutes are done, remove the rice pan off the stove but leave the lid on so that the remaining heat cooks the rice,5-10 minutes. While the rice is still warm, move on to the mixing which involves bringing all that cooked meat and spices to the surface and flavoring the rice. This takes patience and a quite a bit of careful mixing as you don't want to mash the rice. Gently using a long handled spoon, dig into the bottom layer and work on bringing it to the surface until the rice mixes with all the other ingredients and takes on the color of the spices. Keep tasting, should you fill there isn't Salt in the rice, keep sprinkling and mixing while tasting for the right amount of seasoning. It will probably take you a few minutes to mix and combine all the bottom ingredients with the rice, then gently place the hard-boiled eggs within the rice. Garning with raisins, toasted Cashew nuts and Coriander, as a further flavor enhancer add fried onions. Problems that you might come across making this easy chicken pot Biryani the first time. 1/I’m not sure the chicken is cooked through what should I do? The low fire, helps the chicken to cook without the rice burning but if you are still unsure about the process, once you take the marinated chicken off the refrigerator, leave it out to reach room temperature and cook the meat on low fire for 15 minutes and then use it on the layering process. 2/ What should I do if the Biryani looks dry? Sometimes you might find the Biryani too dry, should this happen pour a bit of ghee or oil while you are in the mixing process. 3/There’s not enough Salt in the rice, what should I do? Often when the cooking is done you might fight there isn’t enough salt in the rice to enhance the other flavors, sprinkle the Salt on top and mix it, making sure it spreads evenly.